The unique and simply stunning island of Aegina is one of the most popular of all Greek islands. It is an island that attracts visitors throughout the year, and it's closeness with Athens and the port of Pireaus makes it the perfect island for a weekend break from the city. Aegina is an island with a very long and important history. Evidence of this can be seen from the number of important archaeological and religious sites that can be found all around the island. The island has a great variety whereby you can find quiet and tranquil areas where you can simply unwind and relax, to lively areas where you can enjoy a drink, meal or other local entertainment. 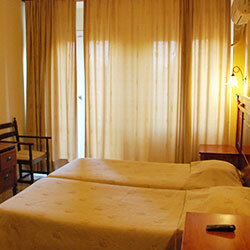 Situated on the northeast side of Aegina is the area of Agia Marina. Here you find the finest sandy beach on the entire island, and which is extremely popular during the summer months. 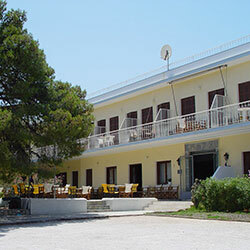 It is also in Agia Marina that you will find the "Galini Hotel", from where we welcome you to our island, and offer you a fine selection of accommodation for your stay in Aegina. Aegina is a wonderful island to spend your holidays. For nature lovers, it is perfect and offers a unique and beautiful landscape around which you can explore and enjoy interesting walks. 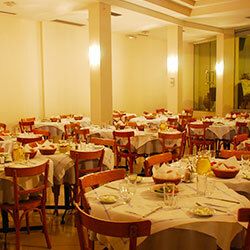 For those who are interesting in archaeological sites, there are several in Aegina which one must try and visit. These include the "Temple of Aphaea", which dates from the beginning of the 5th century BC and is one of the best preserved Doric temples in Greece. There is also the famous monastery of Agios (Saint) Nectarius. This monastery is one of the largest to be found anywhere in the Balkans region. 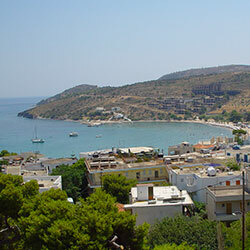 Aegina is the perfect holiday destination for visitors looking to experience the Greek Islands. You will find beautiful beaches, interesting sites, a lively and friendly atmosphere, and a range of bars, cafes, restaurants and tavernas, where you can sample local cuisine as well as local life. We sincerely look forward to offering you our warmest welcome to Aegina, and hope that we can provide the accommodation you are looking for to make your stay here with us one you will always remember and cherish.